"A great experience. Many thanks." "Appreciated the help throughout the process of selling my property and particularly towards the end when things started to go a little pear shaped. Thanks for all the advice and helping to push things along and making it all happen!" "I was very greatful for your service. Thank you very much for all the help i needed." "Kayleigh was a wonderful help during the initial valuation and has patiently guided us through our house sale. In general we were very happy with Kayleigh's efforts." "I thought everything went rather well. Took rather longer than i wanted but i think everybody at Christopher Nevill were very good and helpful. Thanks for eveything." "I am very happy with your service. All the staff are charming. I shall miss you in the Isle of Wight." "I had a lot of contact with Darren and Paul. The house took quite a time to sell and one sale fell through. Throughout the period they remained cheerful and positive which was good from my view point. My solicitor was changed and was not always easily contactable but this did not change the above. Thank you." "Thank you for all your help especially in the circumstances. The sale, despite being long was treated with great sensitivity." "The staff was always very helpful and supportive especially Paul. Well done." "Efficiency and attention to detail made all the difference. Excellent service all round. Thank you." "Thank you to Kayleigh for being particularly interested in seeing this through to exchange and for keeping me informed of progress." "Everyone was great but again my biggest thanks go to Paul and especially Kayleigh who worked extremely hard - brilliant!!" "Most of my contact has been with Darren Murphy who excelled when dealing with every issue that arose during the sales process. He was a tower of support to my buyer who had a difficult time further down the chain. Feel that without his vast experience the prcoess could have been even more fraught. - Thanks Darren, would not hesitate to recommend your services to friends." "Overall a very good service from all at Christopher Nevill." "I found everyone I dealt with very helpful and very professional." "Thank you Darren for keeping me informed about the progress of the sale all the time." "Thank you for persevering. Eventually got there!!!" "Great service! Thank you to everyone involved in both the sale (especially Kayleigh) and in the property management beforehand (especially Bridget and Hayleigh). Fantsatic communication, spot on sale price and purchaser and an easy-ish transaction! Kayleigh kept everyone moving forward and stopped things from stalling. I would/will definitely recommend Christopher Nevill. Thanks again." "Thank you for keeping in touch by phone, giving us the personal touch. Always replying to our queries. Look forward to dealing with you in the future." "All staff that were involved in the sale of our house were brilliant, friendly and very helpful." "Thanks very much for all your help. Kayleigh was excellent." "Everyone has been fantastic. Thank you." "Excellent service, could not have asked for more! Would highly recommend to others." 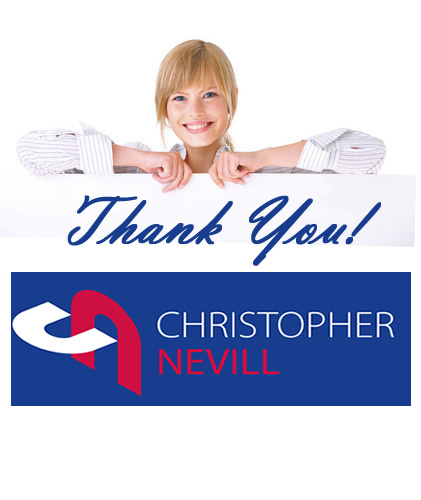 "We would have absolutely no hesitation in recommending Christopher Nevill Estate Agents. We found all staff members extremely pleasant to deal with, especially David Jenkinson who we found to be very knowledgable, friendly and professional at all times. Our entire experience has been very smooth and the sale of the house progressed very quickly. I would like to thank everyone involved with this sale and we would not think twice should we ever need your services again." "Thank you for all your hard work - you are all fab!" "Thanks for all your help David." "David kept me updated throughout and showed a willingness to solve problems (e.g the section 42 notice). Many agents would have sided with the seller regardless, but David's negotiations led to a compramise being reached to buyer and seller were satisfied and the sale could be completed. I've dealt with many agents in this area over the last year and Christopher Nevill were the best. Thank you for a relatively stress free transaction." "Keep up the good work, thank you Darren and team!" "Darren Murphy was helpful, professional, and responsive throughout. "Having dealt with many of the office members over the period of our sale, David stood out to be an excellent member of staff." His communication and promptness was always notable. All calls were promptly returned if he was out of the office. I was very impressed with every element of the progress of the sale we were informed promptly of any development. Kayleigh was also a great asset to your company, she kept me informed and was very polite and courteous. Overall we were highly impressed with the service and have recommended already to friends." "Restored my faith in Estate Agents!" "Always friendly and courteous. Always effective in arranging convenient viewings. Punctual and very polite. "Overall, very pleased with service, and would recommend to others." "My sister and I were selling the family home as our mother is now in a care home. David Jenkinson made a very stressful situation very easy and gave us lots of support. His knowledge of the area and people made it easy to choose Christopher Nevill as the people to sell our house. He was with us every step of the way, and his friendly confident nature was just what was needed. Thanks to all the people who helped us with the sale, we would recommend you." "Hardworking and excellent people. All of you were very good. You worked so hard to sell our property, all your hard work is very much appreciated." "All members of staff we dealt with were extremely helpful and friendly." "Very friendly and personable and made a stressful time more manageable, thank you Jessica and David." 'David and Darren were friendly, responsive and helpful throughout'. "This has been a hassle free purchase, we would like to thank Kayleigh for her helpful and friendly manner." "A friendly, professional service by all your staff. Our questions were positvely answered. Paperwork with solicitors quickly sorted out, altogether an enjoyable experience for us. Thank you." "Made everything very easy - unlike our seller's Estate Agents. No issue at all, will be highly recommending you to others. If only all Estate Agents were like this! Thanks for all your help." "David could not have been any more professional, friendly and knowledgable. The 'girls' in the office were always helpful and courteous. Over all, a brilliant team of Estate Agents." "I wish I'd used you guys to sell my property. I will recommend you in the future. David and Jessica have been fantastic. David especially understood my requirements and helped me along the way." "Kayleigh was really helpful and I was very appreciative of the weekly update calls." "Darren and his team are excellent!" "The service I recieved was excellent from start to finish. David was very professional at all times and I was particularly impressed with his honesty. I would certainly recommend you." "Jessica was very helpful during a long and stressful sale. She deserves a bonus! Please convey our thanks to her." "The sale of our property has gone extremely smoothly, not stressful at all! Many thanks to your team and particular thanks to Kayleigh for her help, advice and friendly service." "Easily the best estate agent in Hillingdon and I have experience of many of the others." "I first used these agents in 1996 when I bought and sold and have since bought and sold other properties as well as using the firm’s lettings department and mortgage broker. Clearly if the service was not excellent in all areas I would not have used their services so such a long time." "Kayleigh has been very attentive, a credit to the team." "Just a thank you to Kayleigh for dealing with the sale of our flat , very helpful, polite and kept in touch." "Jessica has been very helpful all throughout the purchase from day one. Made our move a lot easier. Jessica always contacted us with any updates." "Very pleased with the Uxbridge branch. Hope to do business again." "David has always been very professional and courteous. All the staff in the Uxbridge office have been excellent. It’s been a difficult transaction but has been managed very well by David Jenkinson and his team. It’s really important to feel you are dealing with someone who has your best interest in mind and is trustworthy and David has always maintained this." "David provided an excellent service on what became a very difficult purchase. He is a credit to his profession." "We were very pleased with the service that we received particularly from David. He worked hard for us in the pivotal negotiation period and generally kept us in the loop of the progression of the sale. He operated in a professional manner." "I would like to say, thank you Jessica for dealing with the sale in a competent, professional manner at all times. Always helpful whenever I called and always returning my calls when she was unavailable. Due to this professional level I will always recommend you to all family and friends. Thank you for all your efforts."